Notes: Bentley Soaring in 2019 - College Hockey, Inc.
Beanpot and other rivalries on tap in week ahead. Jonathan Desbiens has scored goals in six straight during Bentley’s recent run. 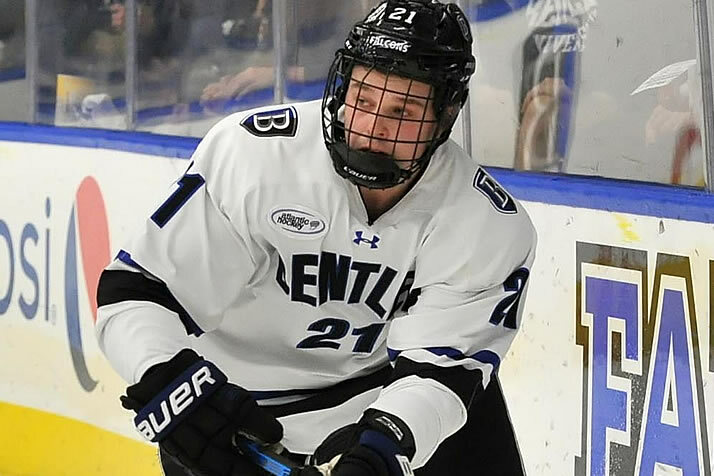 The nation's longest active unbeaten streak belongs to Bentley, which enters a home series with Canisius on a 7-0-2 run since Jan. 5 and 12-11-3 on the year. Four Falcons have more than a point per game in the current stretch including junior Jonathan Desbiens (Montreal, Que./West Kelowna-BCHL), who has goals in six straight games. Desbiens won the 2016 Royal Bank Cup with the West Kelowna Warriors and scored 15 goals in those playoffs; now he's on a similar run and has Bentley in sight of its first top-four Atlantic Hockey finish since 2015 and potentially the school's first conference title. None of the top four teams in the national polls have won an NCAA title, the first week that has happened in the 22-year history of the USCHO.com poll … 21 players have 30-plus points on the year; they represent 14 schools, all six conferences and one independent, 10 states, two Canadian provinces and Germany … Rivalry games this weekend include Yale-Quinnipiac, Michigan-Michigan State (in Ann Arbor and at Little Caesars Arena) and Alaska Anchorage-Alaska … From Friday through Monday 12 games are on national or regional sports networks in the U.S. and Canada … Division I men's hockey commitments in January were, on average, 19 years old.